Books in Chains is the title of a book originally published in London in 1892 that contains the writings of William Blades (1824-1890). Several copies of that edition have been scanned by Google and can be found in the Hathi Digital Library. The book was republished by the Gale Research Company in 1968. I have a copy of that book in my personal library. William Blades was also author of the book The Enemies of Books (Eliot Stock, 1902) which I have written about in a previous post. Blades was an authority on early printing and particularly the English printer William Caxton. In Books in Chains, Blades wrote this about the early practice of chaining books in libraries: "Why chain books? It is certainly a distressing as well as a suggestive sight to see books in chains. Distressing, because a good book is like a strong man, and when chained is as shorn Samson among the Philistines. No one nowadays would think of chaining books to desks or library shelves, for our ideas about such matters have indeed altered from those prevalent when such a custom obtained; ...". Blades compiled a list of all of the chained book collections in the United Kingdom at the time he wrote about them. One of those collections is the one at Hereford Cathedral. Of that collection, Blades wrote: "The collection of books in Hereford Cathedral is an exceptional instance of a genuine Monastic Library. It contains about 2000 volumes, of which about 1500 are chained, being probably the largest chained collection in existence." 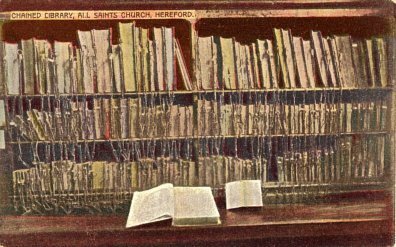 The vintage postcard above, from my collection, shows the chained library at Hereford Cathedral. A brief history of the Hereford Cathedral chained library can be found HERE. I am a graduate student working on a project concerning my local library, its "Friends" foundation, and the programs they run to stay relevant in the community. I am interested in your perspective on this subject. Please feel free to mosey on over to my blog (www.amelianj.wordpress.com) or email me at thatch24@students.rowan.edu if you have any interest in answering some questions for my project. Thank you for your time.